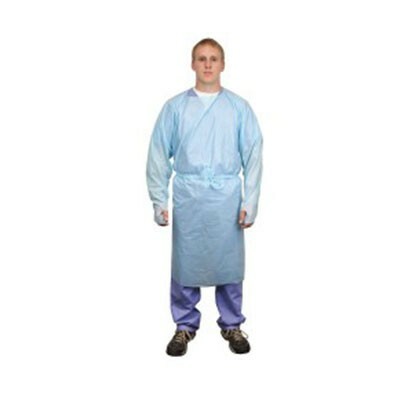 Tidi P2 Disposable Gowns 8576 provides comfort and embossed polyethylene protection. One-piece torso/sleeve design reduces the number of vulnerable seam areas. The open back panel offer cool comfort, and the yoke-style eliminates cumbersome ties for easy donning and removal. Proven synthetic blood resistance – passes ASTM F1670 standard test method for resistance of materials used in protective clothing to penetration by synthetic blood. Proven bloodborne pathogen resistance – passes ASTM F1671 standard test method for resistance of materials used in protective clothing to penetration by bloodborne pathogens using phi-X174 bacteriophage penetrations as a test system (viral penetration). Compact dispenser box uses 75% less space then conventional isolation gowns. Universal size. To view more specifications on Tidi’s P2 Disposable Gowns, please use to the provided PDF. TIDI Products is focused on reducing resource consumption, minimizing environmental impact and acting in an environmentally responsible manner, in order to provide effective solutions without compromising the well-being of future generations Newly designed packaging provides clear, concise, instant communication. TIDI Products is aggressively expanding and diversifying their product portfolio, either through new product development or through the acquisition of companies who are leaders in the marketplace. Our product portfolio includes any single-use product found in the medical and dental environment. TIDI Products can be found in hospitals, physician, dental and chiropractic offices, extended care facilities, SPD departments, oncology units, EMS vehicles and more. To handle this responsibility, TIDI Products is focused on understanding the needs of medical and dental providers and the requirements of the patients they care for. All of our products consistently meet rigorous quality assurance guidelines, including ISO, FDA, OSHA and the CDC.